Uploaded to Youtube by user Bamosbellamy is this clever video of a badminton match in which he edited in light sabers and the corresponding audio. Posted here because it is Star Warsy coolness. According to his blog, Faraway Looks, author John Jackson Miller will be appearing this weekend at MidSouthCon 29. Among other scheduled events, he will be part of the Knight Errant panel on Saturday (3/26) at 7 PM. You can check out the entire MidSouthCon 29 schedule here at their website. Star Wars books has announced that it will be hosting a question and answer session with Deceived author, Paul Kemp, on their facebook wall next Wednesday (3/30/11) at 6:30 PM, Eastern time. Get your books and questions lined up and join the fan fun. Wondercon 2011 opens April 1st, and will be hosting several Star Wars events, including The Clone Wars: Secrets Revealed on Saturday, April 2nd. Dave Filoni with be on the TCW panel as well as Ashley Eckstein (Ahsoka Tano) and Peter Mayhew (everybody’s favorite wookie, Chewie). 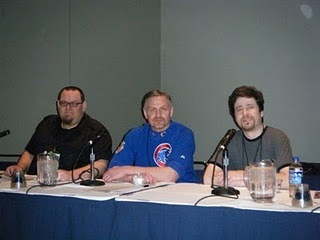 You can check out the full schedule of events at Wondercon 2011. You can find TCW director, Dave Filoni’s latest fan Q & A session over on his Facebook page. Dave answers question ranging from will a young Han Solo be making an appearance to who his favorite Penguin is. Get these answers and more here.